There are so many off-the-beaten-path and gorgeous spots in Chicago that are great for amazing photos. Here are the top 7 most beautiful. So you’ve taken a selfie of your reflection at the famous Cloud Gate (aka “The Bean”). And you’ve looked down at the city below your feet from the 103rd floor of the Willis Tower Skydeck. But now you’re ready to take a break from the crowds. And see something a little off the beaten bath. Something memorable and scenic and beautiful. If this describes you, I have some good news. What I noticed, as I wandered the streets of Chicago, was that there were scenic and photogenic spots everywhere. Incredible architecture, beautiful parks and gardens, and stunning river and lake views. Let’s begin with one of my favorite spots in Chicago. Lincoln Park Conservatory is a breath of fresh air, with vividly colorful gardens that stretch through open fields. Plus lovely palms and exotic flowers inside a stunning glass greenhouse. Next door, the Lincoln Park Zoo is surrounded by more parks and conservation land. This area is filled with vivid flowers, gorgeous greenery, and beautiful fountains. With all of the open green space, this section of Chicago is serene and stunning. As you can see, there are photo ops everywhere! Cindy’s Rooftop Restaurant is my favorite way to view Cloud Gate. From this vantage point, you’ll see “The Bean” from high above, surrounded by parkland. In the distance, the bright blue waters of Lake Michigan seem to melt into the sky. Cindy’s is a gorgeous restaurant serving lunch and dinner (plus brunch on weekends). The atmosphere of the restaurant is elegant and upscale, but still casual and lively. If you’re interested in checking out the incredible view of Chicago from this restaurant, be sure to book a reservation asap! Chris and I tried to book a table a couple of weeks before our trip, but we were too late and couldn’t get a reservation. Centennial Wheel is located at Navy Pier, and it’s a giant Ferris wheel that reaches heights of almost 200 feet. Chris and I visited Navy Pier mostly for Trevor’s sake. There are lots of kid friendly activities at Navy Pier, like an indoor park, a children’s museum, and a carousel. But I was blown away by how much I loved the ride on Centennial Wheel. We went for a ride on a weekday evening in September. We were lucky, and there weren’t any crowds or lines. And the views of the Chicago city skyline were incredible! Centennial Wheel has climate controlled, private gondolas, so it’s a really comfortable ride. And the floor-to-ceiling windows offer beautiful vistas of the city on one side and Lake Michigan on the other. I highly recommend checking this out at sunset! Riverwalk is my favorite way to check out the stunning and historic architecture of Chicago. It’s a pedestrian-only walkway along the Chicago River that’s over a mile long. Riverwalk is a nice escape from the chaotic city streets, and the views of the city are stunning. 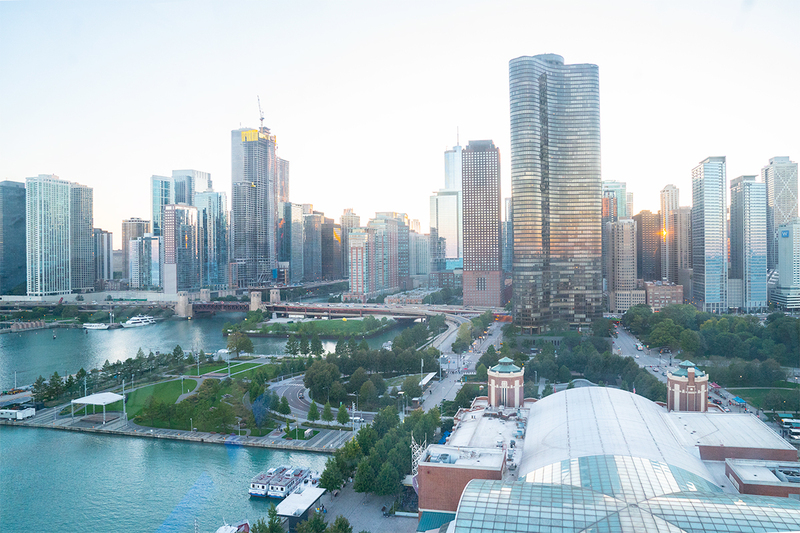 You’re guaranteed to find handfuls of scenic shots of the gorgeous Chicago architecture! Everywhere you look, you’ll see ornate sculptures and marble columns surrounding a grand staircase. As you wander the mansion, you’ll find one beautifully preserved room after the next. I loved photographing the stained glass dome ceiling, the paintings and sculptures, and the lavish furnishings. You’ll find another incredible building interior at Palmer House. This historic hotel has a fascinating history! It was originally opened in 1871 but burned only 13 days later in the Great Chicago Fire! The owner immediately rebuilt the hotel with what was believed to be the largest individual loan at the time. Stop by the Palmer House and you’ll understand why this building was once considered to be one of the most opulent hotels of its time. The chandlers, elaborate moldings and columns are all beautiful. But the most jaw-dropping part of Palmer House is definitely the intricate ceiling fresco! You can find Buckingham Fountain in one of Chicago’s best-known parks, Grant Park. It’s one of the largest fountains in the world! It was built in 1927, and was inspired by the fountains of Versaille. It’s a stunning spot for photos, with the colorful skyscrapers of Chicago stretching up behind it! Tip: During the warm months of the year, there’s a light and music show after dark. The light display happens every hour, and lasts about 20 minutes.